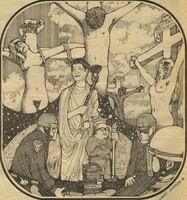 This cartoon depicts the crucifixion of those who exhibit counter culture ideologies. Titles above the crucifixes are labeled with perpetrator's crime, such as "Question Authority," and "Militant." “Berkeley Barb Counter Culture Political Cartoon,” Student Digital Gallery, accessed April 24, 2019, https://digitalgallery.bgsu.edu/student/items/show/8239.